Since starting at George Mason University, my department regularly holds a Round Table group. One of my colleagues began it shortly before I arrived. Someone in the department selects a couple of articles, book chapters, etc., around a theme; we read the articles; and then meet to talk about them. It’s not a particularity novel idea, but it has been instrumental in professional development in my department. Since my research often focuses on communities of practice, I’ve found it as an effective way to develop library instructors who are not in professional positions, who have limited teaching experience, or who do not have an MLS – our legitimate peripheral participants in the profession. As applicable, we’ll follow up these round tables with a workshop where we work on instructional ideas related to the readings. Do you teach students how to evaluate sources without using a checklist approach? If so, how? Have any readings you’d suggest for future reading? Let me know! Once a week, I work from one of my university’s distributed campuses. The primary reason that I work there is to work with the two subject librarians stationed there on a regular basis. Last week I went to lunch with one of the librarians and as usual, we talked a lot of shop. She asked me how assessment was going. I’m sure she heard more from me than she bargained. But then she asked, “What would radical assessment look like?” I think she asked it to herself as much as she asked me. We spit-balled the first ideas that came to mind. What I landed on was this: Radical assessment removes assessment from the institutional accountability prerogative. In other words, I don’t think it’s possible as a singular form of assessment; however, I think it’s what assessment should aspire to be. Radical assessment is collecting evidence of student learning in order to improve instruction so that students are able to have a higher quality learning experience. You might be saying to yourself, “but that is assessment.” I would argue that is what assessment is supposed to be, but not what it is in reality. Too often we assess because we’re told we must. We’re told by our accreditation agencies, our administrators, and by our assessment librarians. Don’t get me wrong, we need to be assessing. Accountability, and whatnot. And so for me, radical assessment is designing assessments that are meaningful first, and evidence for institutional accountability second. What does “meaningful” mean in this context? I get asked this a lot since my Library’s Student Learning Assessment Plan is based on the concept of meaningful assessment. Each librarian who teaches is asked to complete one meaningful assessment project over an academic year. Meaningful is at the interpretation of the librarian. I tell them: It should be meaningful to your instruction while applying to one of our learning outcomes (the institutional, non-radical aspect). How will it improve your instruction? How can you use it as evidence to teach more (or less)? How can it help your students learn? To me, if you start and build from there, you’re assessing radically. I know there are plenty of different interpretations of what radical assessment looks like. One of my colleagues had some interesting thoughts. He has multiple interesting tweets, which I encourage you to read, but this one has me thinking. . .
@maoriakirker Or, perhaps putting IL assessment into the service of a larger social, political, or economic transformation? What is radical assessment, particularly in context of information literacy, to you? I’d love to hear your thoughts. The ACRL Board of Directors has decided to adopt the Framework for Information Literacy in Higher Education. Taking the lead from professional sports, the Board has adopted the Framework with an asterisk. The Board decided not to sunset the current Information Literacy Competency Standards for Higher Education until the profession sees how the Framework plays out. Of course having a clear vision and direction for information literacy instruction has its benefits. It unites the profession; it gives us clear direction; we’re all on the same (theoretical) page. But if we want to continuously move forward as a profession, doesn’t a division into various camps help guide and accelerate that progress? Sure, there will be some camps that stagnate or even regress, but I’m optimistic enough to believe those would be in the extreme minority. But a division into different theoretical or practical approaches to information literacy instruction might be exactly what our profession needs to keep pushing us forward. It’s been a while since I’ve seen the look. As instructors, we’ve seen it many times. We’ve probably seen it by multiple students in one session. The “You’re wrong” look. The look of defiance. The look that often indicates that the student has shut down. They aren’t going to participate anymore, or worse, they’re done learning because the student is unwilling or fearful to tell the instructor that they think they’re wrong. How do you deal with students who check out after they appear to no longer trust your expertise? Recently I’ve been thinking a lot about learning styles. Settling into a new job requires a lot of learning, and at this point in my career most of this learning involves internal policies, processes, and politics. Or as I’ve been told by a few, mostly just politics. I’ve been reminded how often times the teacher teaches to their preferred learning style. Everyone is guilty of this, myself included. It takes careful, deliberate effort not to teach solely to your particular style. If you believe that learning styles exist, there are plenty of approaches to learning styles. 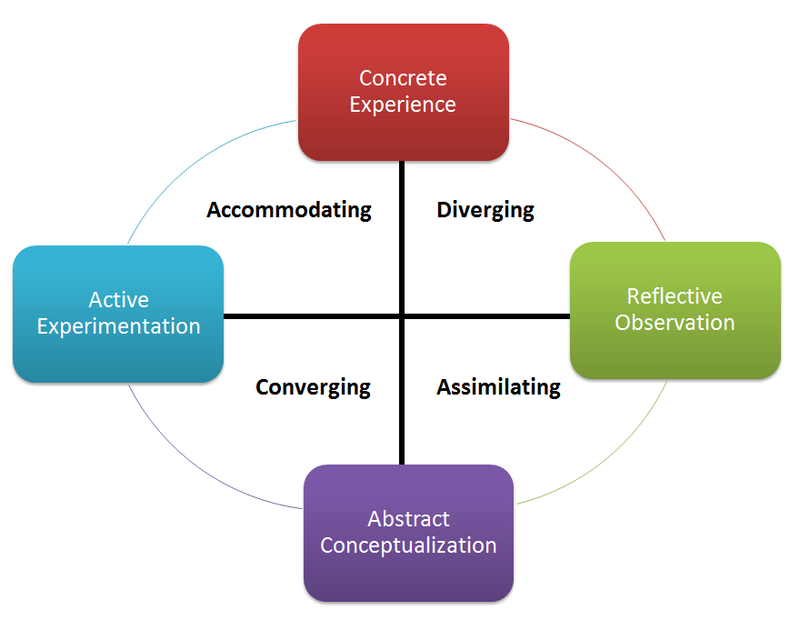 Since I had a sip from ACRL’s Immersion Kool Aid, I tend to keep Kolb’s Learning Styles as a model in the back of my mind. I also think that the VARK model has a lot to offer, especially in regards to active learning. You can take a fancy test to determine where you fall. I tested as an Assimilator. If you look at the career characteristics for Assimilators, it’s basically a librarian. Whether you follow Kolb’s model or another model, what’s important to remember is that everyone learns differently. Just as we try to teach to different learning styles in the classroom, new employee training and professional development training should attempt to teach to different learning styles too. In my case, my new supervisor has created a flexible training environment, capable of molding to how I learn best. Some will argue that learning styles are a myth. They may be right, but I like to think there is a middle ground and that ground is providing multiple ways to learn the same thing. Teach the same material in different ways. If you can know how your students learn most effectively, that’s ideal, but librarians usually don’t have the time to know students at this level. So we diversify how we teach to reach as many students as possible. We diversify to engage, and when students (or new employees) are engaged with the content, they will learn.